Click here for Senate District 22 Special Election results. The State Election Commission met Monday, April 1, to make appointments to county election commissions. Individuals appointed shall qualify within twenty (20) days by filing their oath of office with the State Election Commission. 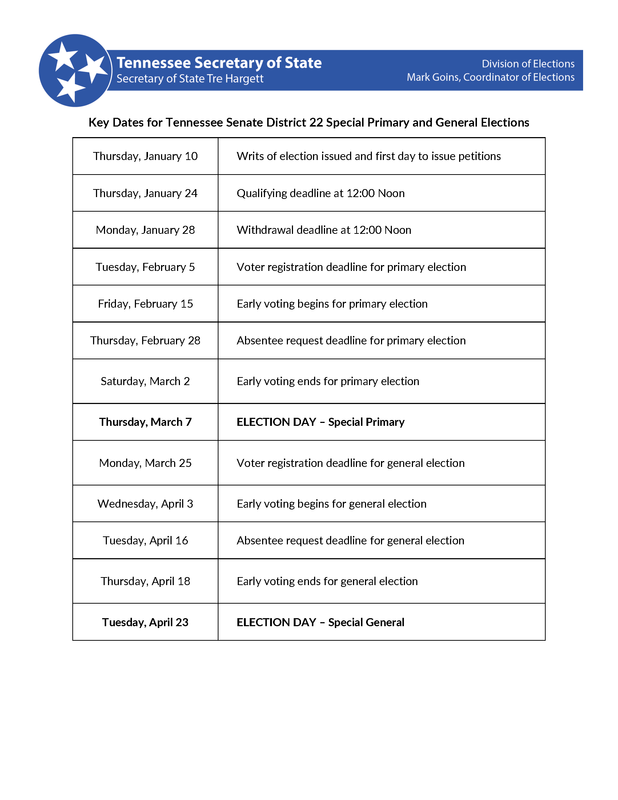 There will be a special election for voters in Montgomery, Houston and Stewart counties to fill the Tennessee Senate District 22 vacancy. The writ of election and key dates are now available. The primary election was held Thursday, March 7, 2019 (view unofficial results). The general election will be Tuesday, April 23, 2019. Results will be posted at elections.tn.gov after the polls close. Learn more about the State Election Commission. Provides a link to the voter registration application and outlines the qualifications to vote. This tool allows the voter to review their registration information, the early voting schedule and locate their Election Day polling place. How do I request an absentee ballot if I am in the military or overseas? If I have a felony conviction, can I vote? Tennessee Secretary of State Tre Hargett today appointed the state’s two representatives to the U.S. Election Assistance Commission (EAC) Standards Board, in compliance with the Help America Vote Act of 2002 (HAVA). Secretary Hargett appointed Tennessee Coordinator of Elections Mark Goins, a Republican, and Rutherford County Election Commissioner Carolyn Peebles, a Democrat, to the Standards Board. HAVA requires the chief election official of each state to appoint one state election official and one local election official and the two members appointed may not be of the same political party. October 4, 2018 - Tennessee Secretary of State Tre Hargett is warning voters to be aware of misleading information regarding voter registration as the deadline to register for the November election approaches on Tuesday, October 9. Tennesseans will head to the polls across the state Thursday to vote in the Aug. 2 primary. 626,894 Tennesseans voted in person or absentee during the two-week early voting period which ended Saturday, July 28, 2018. A comprehensive breakdown from the Division of Elections shows how this turnout compares to past election years. The Division of Elections is headed by the Coordinator of Elections, Mark Goins, who oversees the election process in the State of Tennessee. The Coordinator of Elections works directly with ninety-five (95) local county election commissions, candidates and the public on election related issues. The county election commissions are appointed by the State Election Commission. There are ninety-five (95) county election commission offices throughout the State. The State Election Commission is composed of seven members, four from the political party holding a majority of seats in the General Assembly and three from the minority party. These individuals are elected for a term of four years. This is the only commission in Tennessee state government which is elected wholly by the General Assembly. To be eligible to serve on the State Election Commission one must be at least 25 years old, a resident of this state for at least seven years, and a resident of the grand division of the state from which one seeks election for at least four years preceding the election. No more than any two members may be from the same grand division of the state. Candidates for statewide offices qualify by filing their candidate petitions with the commission, and the commission must pass on the correctness and propriety of such petitions. The commission works very closely with the coordinator of elections toward the common goal of maintaining uniformity in elections as well as preserving the purity of the ballot.